NOTE. 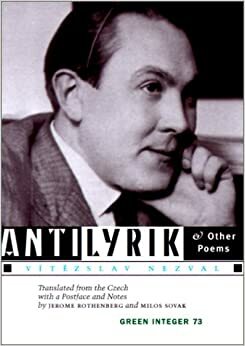 Nezval (1900-1958) was, with Velimir Holan, one of the two great early poets of Czech experimental modernism. Like other innovators then & now, he worked through a prolific sweep of modes & genres: open & closed forms of verse; novels drawn from his childhood & more surreal, chance-oriented prose works; avant-garde theater collaborations; numerous translations of his modern counterparts & predecessors (Rimbaud, Apollinaire, Neruda, Lorca, Eluard, et al. ); & forays as composer, painter, journalist, photographer, & (from 1945 to 1951) director of the film section of the Information & Culture Ministry in Prague. His commitment to Communism came early (1924), & his politics before & after made him a prominent member of that network of tolerated avant-gardists/poet-heroes that included Neruda, Brecht, Picasso, Hikmet, Eluard, & Tzara, among others (with some of whom he shared pro-forma hymns to Stalin in the early postwar years). As with many of them also, a Surrealist connection was clearly in evidence but should in no sense diminish the originality of his own practice & its contribution to ours.